John Bacher Construction Limited has applied to the Ontario Ministry of Natural Resources and Forestry proposing to develop a new 53 acre quarry operation located on McClintock Road (formerly Fletcher Bay Road - Lots 11 and 12, Concession 2 in the Township of McClintock) – the ‘McClintock Quarry”. The development will have a direct impact on properties located on Harvey Lake, Otter Lake and UR INTEREST ON OUR WEB SITE parts of Kawagama Lake touching Fletcher Bay, including properties on Wes Clarke Drive and North Creek Drive. As well, properties further down Livingstone Lake Road will be impacted by the heavier truck traffic as they progress towards Dorset, as well as noise from blasting and crushing. The McClintock Quarry Application is for a license for a maximum annual extraction of 280,000 tonnes of gravel and bedrock. The proposed development is not in compliance with the Official Plan of the Township especially with regard to a requirement that such operations be located at least 1 Km from a Waterfront Designation. The proponent will be applying to the Township of Algonquin Highlands to waive this requirement. In some cases the quarry edge will be within 150 metres of properties on Harvey Lake. The Application reports also suggests an additional volume of heavy trucks of 10 trips per hour (every 6 minutes) along McClintock Road and Livingstone Lake Road. There are suggestions in the press and elsewhere that the Applicant may reduce the maximum extraction request significantly and that even at the reduced level they will only use a small fraction of the approved maximum. In the Haliburton Highlander the Applicant suggested they are applying for much more than they can use “I want this pit to be used by my son and grandchildren. The restrictions around these proposals are getting so tough, so if I can set this up now, it just helps us in the long run,” This is ridiculous logic - I’m just going to use a little bit now, but give me a lot more so my children or grandchildren can create a BIG mess. 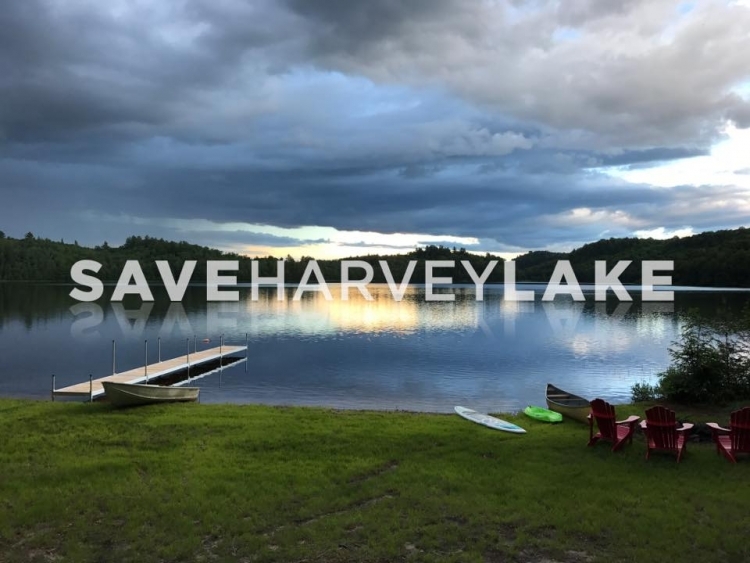 1.The proposed development will directly abut and have a devastating impact on the enjoyment and values of the 9 properties on pristine Harvey Lake. Almost 60% of these properties are in the hands of second-generation owners, some in the hands of fourth-generation owners. The notice of the development was dropped on these owners like a bombshell the week of July 10th and they were given only until August 7th to gather support and provide their comments to the Ministry of Natural Resources and Forestry. A classic David & Goliath fight for these owners of relatively modest properties, without an organization or resources to fight what seems a stacked deck. Many of the residents are in tears over their potential loss of value and of being forced by the development and operational noise and disruption to abandon the site of generations of family memories. 2. Massive increase in heavy truck traffic on McClintock Rd and Livingstone Lake Road. The proponent’s consultants have based disruption calculations on traffic flows of up to 10 loads per hour, utilizing a projected near term volume of 100,000 Tons/year. We believe these calculations count only full loads, so the total increase in traffic volume from return trips could double that figure. 3. Lower property values for all properties impacted by the noise and heavy increased traffic on haul route along McClintock Road and Livingstone Lake Road- (County Road 12) and County Road 8 from Kawagama Lake Road to the Hwy 35 turnoff, where many properties are within 30 metres (100 feet) of the road. 4. Heavy use from trucks will put wear and tear on our municipal roads leading to higher taxes and road delays. There is a suggestion the Township might require the proponent to pay for initial road upgrades if required, but ongoing maintenance will be paid for by all taxpayers. 5. Negative impact on traffic and safety – Livingstone Road in particular has a number of hills and curves. Existing use by sand and aggregate trucks and logging trucks already create dangerous conditions for walkers, cars entering and exiting driveways/side roads, and cyclists. This will be exacerbated. 6. Negative impact from extra noise and vibration from trucks traveling on haul route, blast zone and processing materials. 7. Negative impact on air quality from dust pollution with this type of activity and trucking haul route. Citizens living adjacent to pits and quarries or in surrounding areas have a higher instance of bronchitis, emphysema, asthma and other respiratory illnesses. Fine dust particulates are particularly hazardous to children and the elderly. 8. Negative impact on species of special concern and rare wildlife – including two habitats of the threatened Blanding’s Turtle, which has been identified as inhabiting the site in the environmental report. The identified habitats of the Blanding’s Turtles are immediately adjacent to areas where blasting will occur. No environmental assessment has been provided concerning the impact of blasting noise and compression waves on the turtles. Quarry operations will be conducted between the two areas identified as habitats for these turtles. The operation plan seems to believe that the turtles will stay within each identified habitat. No visiting by lovelorn turtles? This seems to be an unrealistic assumption. 2. Attend the information session on the proposed quarry development being hosted by John Bacher Construction to be held on Saturday July 29th from 9-11am at the Dorset Recreation Centre, 1051 Main Street, Dorset. We, the undersigned, oppose the development of a new quarry at Lots 11 and 12, Concession 2 in the Geographic Township of McClintock. c.	Actively support residents and ratepayers opposing this development. The NO McClintock Quarry petition to Ministry of Natural Resources & Algonquin Highlands Council was written by NO McClintock Quarry and is in the category Environment at GoPetition.